The following review was conducted in November 2009. Please note this phone model has since been discontinued and is not recommended for new OnSIP customers . 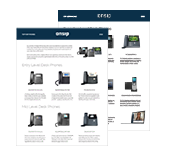 The OnSIP team is happy to see that Cisco is still pushing out new phones for their small business customers since taking Linksys under the Cisco brand. Their new Small Business Pro Series, which includes the SPA501G, 502G, 504G, 508G, and 509G, are the successors to the popular Linksys SPA9XX series. Although these new phones look very similar to the old Linksys series, there are actually a few noticeable upgrades that make them more than just a rebranding of the old models.